a device for measuring the pressure of acoustic radiation and, consequently, a number of important characteristics of a sound field, such as the sound energy density and the sound intensity. The usual acoustic radiometer is a light moving system that is positioned in a sound field on a flexible suspension; it has the form of an ordinary pendulum, a torsion pendulum, or a torsion balance. The sensing element is a light disk, ball, or cone whose diameter is larger than the wavelength. The force due to the radiation pressure moves the sensing element from its equilibrium position until the action of the force is balanced by a force that depends on the design of the radiometer. In the pendulum-type device (Figure 1,a), this balancing force is the component of the force of gravity that arises when the suspension is deflected by an angle α. In the torsion-balance type (Figure 2,b), the balancing force is the elastic torque of the wire. In a compensation acoustic radiometer, the sensing element is returned to its initial position by the application of an external force. A simple example of such a radiometer is the sensitive beam balance shown in Figure 1,c. The pressure of the acoustic radiation is calculated from the radiation force, which depends on the relation between the wavelength, the dimensions of the radiometer’s sensing element, the shape of the sensing element, and the sensing element’s reflection coefficient. Figure 1. Diagrams of some acoustic radiometer designs. (a) Pendulum type: (1) sensing element, (2) rigid arm with needle supports in agate bearings or suspension wire. (b) Torsion-balance type: (1) sensing element, (2) rigid arm, (3) elastic stretched thin wire. 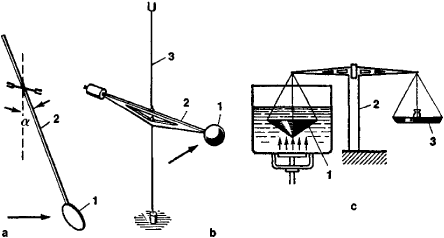 (c) Beam-balance type: (1) conical sensing element, (2) beam balance, (3) pan with weights; the arrows indicate the direction of propagation of the ultrasound. One of the simplest and most accurate methods of determining the intensity of ultrasound employs an acoustic radiometer. Since, however, the radiometer is sluggish and is subject to the influence of sound streaming, the accuracy of measurement is reduced. Kolesnikov, A. E. Ul’trazvukovye izmereniia. Moscow, 1970. Chapter 4, subsec. 17.